Even though the elves are busy helping Santa all year long, they do take the time to relax and enjoy themselves once in a while. They even take part in happily singing Christmas carols, playing games and sharing their craft secrets with lucky people. And they have decided to share all of that...with YOU! Raise your voices in song! Click here for the lyrics to 57 of your favorite Christmas carols! Want to play some fun word games? Trivia? Click here. 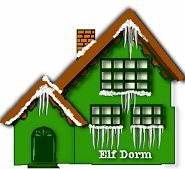 Want to try your hand at making some elf crafts? Click here. Another favorite elf activity is curling up with a good book. Here are some elf suggestions!